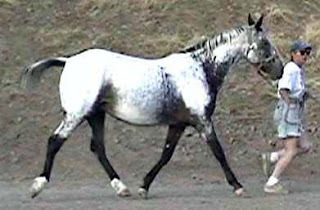 Many times in the past months, I've commented on the changes in the Appaloosa breed over the past 20-30 years. I personally am a big fan of the fact that AQHA and TB blood has been introduced and that the show standard for ApHC has become a horse who has a pretty head, elegant neck and flowing tail. However, I know that there are people out there who prefer what is now referred to as the "foundation" Appaloosa. Something that has the classic Appy look and does not look conformationally like a Quarter Horse with spots. So today I set out to see what I could find of the old style Appies and see if I could find some that had the "look" but were still improvements on what the breed used to be. I was not disappointed. I found excellent examples of both ends of the spectrum! This time I'll start with the one I like. These folks are breeding spotted sport horses, and they are breeding good ones! Nobody would mistake this guy for anything but an Appaloosa. If he were painted chestnut, he'd just look like a breeding stock Appaloosa. He has the foundation type head, and that tail looks like it was the best he could do, try as he might. He's got super loud coloring, enough to please any Appaloosa fan. This horse has a fantabulous shoulder, he's compact, and he has an elegant neck (though set on like a jumper's - not a western pleasure horse). He's standing a bit splay footed and he looks like he's a bit over at the knees, but considering he is used for eventing and fox hunting, among other disciplines, I am willing to bet that is age/work related. Overall, this is a cool horse, and one that definitely earned his right to keep his testicles. Unsurprisingly, his offspring are doing very well in equally competitive endeavors. This is a compendium of everything I have criticized about Appaloosas. With that downhill build and that stunningly straight shoulder, I can only imagine its trot feels much like riding in a 1970's era Jeep. It's got the world's shortest croup, a short neck, and very little muscle overall. The head is similar to the first horse's with perhaps a little less jowl - but isn't it amazing how much better that kind of head looked with a good neck attached to it? I can't remember where I found the 2nd picture, so I am not alleging this animal is being recommended for breeding or anything. 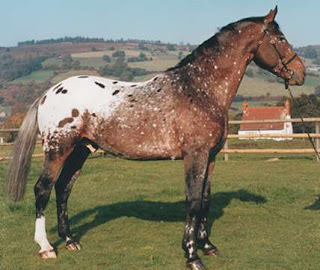 Just using it as an example of what not to create in the Appaloosa breed! If you want to preserve a "classic" type, fine, but don't preserve conformational defects that impair athletic ability and lead to unsoundness. Just posting this one because I had to - the fugly stopped me in my tracks. Of course, she already has a baby and you can buy them as a 2-in-one package for just $1300, which the seller assures us "is a BARGIN" - "becasue I have found a couple of Paint mares that I want to get." Ah yes, there's nothing like mixing up your backyard breeding program by swapping over to another colored breed you can produce crappy examples of! Variety is the spice of life! They also claim this mare has points. In what they do not say. I cannot imagine. The only point I see is on the top of her hip. I know it's a bad pose, I know, but there isn't any way on earth to stand this mare up and have her look good.